An overview of the 4th of August government’s policies during its first 2 years. Issued for accountability purposes (or, as some would say, propaganda matters). 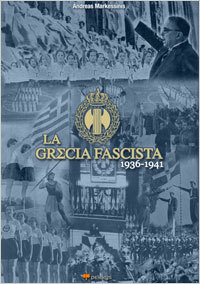 A resume of the Sports, Athletics and Gymnastics policies and events of the Metaxas regime during its first two years (1936-1938) for propaganda purposes. It contains explanations as well as pictures. A predominantly photographic account of the 4th of August state’s activities during its first two years. It gives a complete picture of the accomplishments of the Metaxas government across all areas: from military issues to culture, from foreign relations to Metaxas’ journeys inside Greece. This book is a compilation of press clips by foreign media, collected by the the Ministry of Press and Tourism under Nikoloudis. It reproduces excerpts from foreign newspapers and media outlets on a monthly basis, staring on August 1936 and ending in July 1938. A photographic briefing of the policy of the 4th of August regime during its third year (August 1938 – August 1939), issued for propaganda purposes. Issued by the Ministry of Press and Tourism under Nikoloudis, it gives the impression of a country in perennial movement and continuous advancement. Translated as “Numbers speak for the work of the 4th of August state” this is data-driven overview of Greece’s economic performance and improvement during the first 3 years of the 4th of August regime. It has two main parts, one plenty of statistics, and the other one as an account of the implemented changes. A resume of the the three first years of the 4th of August State, issued for accountability purposes.